Late last year Elektor released their most recent publication on the increasingly popular subject of hi-fi tube audio, Fundamental Amplifier Techniques with Electron Tubes by Rudolf Moers. The new book is actually the English translation of "Fundamentele versterkertechniek met elektronenbuizen" (ISBN 978-90-5381-226-6) authored earlier in Dutch by Rudolf Moers. The thick hard bound book is 834 pages and seemingly covers what appears to be just about every topic on the subject of audio amplifier design with vacuum tubes. I recently had an opportunity to read the book and here is my overview of the new electron tube book. The thick book is divided into ten chapters. At just a few pages each, the first two chapters, (1) Introduction and (2) Principles of Electron Emission are very small relative to the remaining chapters and book. These very short introductory chapters provide only a very brief overview and assume that the reader has a reasonable background in electronics. The meat of the book begins with chapters 3, 4, 5 and 6 which each respectively go on to cover the basic electron tube types: diode, triode, tetrode and pentode. For each of the basic tube types the chapters generally include information on tube construction techniques, the tube characteristics, all the typical tube applications and several design examples. The chapter subsections are quite detailed and will for example get into the formulas and calculations of AC ripple that can be expected in a C-L-C pi-filter and calculating gain of as common cathode amplifier. Over 200 pages are dedicated towards the pentode and over 250 pages are spent on the tridode. The book also contains many technical questions which the reader can work through, much like the questions that would be found in a science text book. A detailed solution accompanies each of the questions and this makes the book a very good learning tool for those interested in audio theory and design. Frequency Dependent Behavior is covered in the 88 page Chapter 7. The chapter goes into details regarding linear distortions for the various components that make up an amplifier. Non-Linear Distortions and Noise are discussed in Chapter 8 and the various types of Negative Feedback is the topic for Chapter 9. The final chapter (10) pertains to the construction of electron tube amplifiers. As a builder of amplifiers I found interest in this chapter as it contained good practical information on electronics components, various construction techniques, crosstalk, heat / cooling issues, grounding, shielding and safety. Also included in Chapter 10 are additional details of Rudolf's parallel push-pull 300B monoblock tube amplifiers among other of his amplifier builds. The full table of contents for Fundamental Amplifier Techniques with Electron Tubes is available from Elektor's website [PDF - 163kB]. The book which is written in a technical format with plenty of theory, math and graphs will be primary suited towards advanced hobbyists with a strong understanding of analogue electronics and towards students and professionals involved electrical engineering and audio design. Those without a good background in electrical science may not find the text and formulas all that easy to follow. The carefully written book is a significant undertaking and provides plenty of accurate and valuable theoretical information on numerous subjects related to understanding and designing electron tube amplifiers. Congratulations to Mr. Moers and his colleagues for the excellent learning tool and resource that they have compiled. I will continue to find value in this book as a reference resource in my workshop. 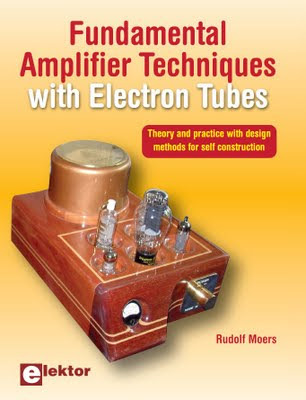 The book Fundamental Amplifier Techniques with Electron Tubes, by Rudolf Moers (ISBN 978-0-905705-93-4) is available for $104.90US (plus shipping) from Elektor.